Kara and Alex head home to Midvale for a little R&R. While there Kara remembers a childhood incident. I have no words to gush over how great this episode is. But I can say that the casting of the teenagers was excellent, you really got the sense that you were watching their younger selves. I also really loved this one. Great casting, great first case. One of my favorite episodes, which I basically never say about flashbacks to child/teen versions of characters. The casting director should definitely get some kind of award, because Li'l Alex and Kara were spot-on. I liked this one too. Parts didn't make much sense (Kenny suddenly being an important part of Kara and Alex's history, nobody but the girls affected by Kenny's murder or concerned that that the killer is still out there, the sisters sharing a bedroom in that huge house, etc.) but it was a lot of fun. I'm midway through watching S3 of Smallville so I appreciated all the callbacks. I've seen some bitching about this episode, but I liked it. Also because well, Alex crying and eating ice cream with Mom or whatever probably would not have made for scintillating television. I was surprised at how much I was attached to Kenny after 5 minutes. The guy who played Kenny, Ivan Mok, deserves a lot of credit. He was warm and clearly into Kara without being needy or presumptuous. It was perfect, and he made the audience really love him with so little screen time. He and Melissa Benoist were great together, too. So good. I hope to see him again soon. I wonder how much of Smallville is supposed to be canon? Chloe was imported into the mainline Superman comics after Smallville's success, so much like Harley Quinn from Batman lore, she's fair game for use in other media. Ahh. Did not know this - my actual reading of comics is pretty limited and eclectic, and I mostly know stuff via adaptations. Like, my definitive Lex Luthor is Clancy Brown. I did get momentarily confused when, in the past, J'onn drove off in the car that the sisters had arrived in at the beginning of the episode in the present. Serious question: Why would J'onn care if they scratched his shapeshifty spacecar? Can't he shapeshift the scratches out? Why would J'onn care if they scratched his shapeshifty spacecar? I didn't want to put this in the post itself, but it was slightly jarring to me when they mentioned Chloe what with the news I've been hearing about Alison Mack. I'll leave you all to look it up but it's... disturbing. I am glad to hear, though, that the character is in the comics and that's where they can draw from. He and Melissa Benoist were great together, too. Wait, Kenny didn't interact with adult Kara... 'cause... you know. Do you mean Izabela Vidovic, the young Kara actress? - As of this episode, Kara is the only character to appear in every episode as this is the first episode in which Winn does not appear. - This episode features the smallest main cast of any episode of the series at three. - Eliza is seen reading the "Nine Lives and Counting" by Cat Grant while waiting for the girls to come to breakfast. - This episode references the character of Chloe Sullivan and her "wall of weird", these are references to the TV series Smallville. Erica Durance previously played Lois Lane in the fourth season until the series' conclusion in Season 10. - Midvale High School is in reality Vancouver Technical Secondary School. Between 2001 and 2005 (and once in 2010), this school was used as Smallville High School on Smallville. - While in Alura's form, J'onn uses the pseudonym Noel Neill. The name reference the actress who played Lois Lane in the 1948 Superman film and Atom Man vs. Superman in addition to the Adventures of Superman TV series that aired from 1952–58. Neill also made appearances in the TV show Superboy, and two live-action Superman films including the 1978 film and Superman Returns. The latter previously featured Brandon Routh in the title role. - There is a continuity error in this episode. 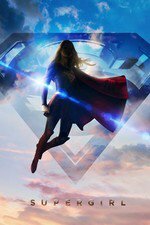 Young Kara asserts that she is "literally bulletproof", while in the pilot episode, adult Kara is unsure if this is the case however it could been due to Kara's lack of concentration since she remained dormant with her powers until she became SuperGirl. - The flashback notes it was 10 years prior to the episode. However, young Kara was age 15 at the time, and adult Kara was age 25 in the Pilot. This should note the flashback was 12 years ago. Ivan Mok was fantastic on this past season of The Americans, in a, uhh, very different role, so it's really nice to see him getting some more work, and especially without getting typecast. I didn't realize that either, thought it was just a cutesy easter egg. Good to know! I always like when original non-canon characters do well enough in adapted media that they are imported back into the original property. It's like saying to the show/film/game developers "You did so well with your work that a little piece of it will live on forever as part of the main franchise." It has to be the greatest honor a creative person can receive when working with someone else's characters and universe. Any speculation on what J'onn's licence plate refers to?